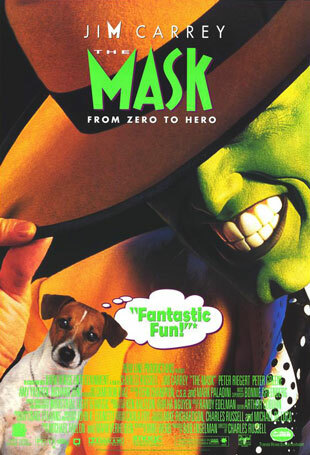 Tag line: "Stanley Ipkiss is not the man he used to be"
Having already scored a hit with Ace Ventura: Pet Detective, Jim Carrey returned to the big-screen with 1994’s The Mask, proving to the world that, when it came to physical comedy, he was in a class by himself. Stanley Ipkiss (Carrey) is a shy, mild-mannered banker who lives alone in a small apartment with his pesky but incredibly smart dog, Milo. Try as he might, Stanley can’t hook up with any women interested in dating a nice guy. Even his newest customer, a gorgeous blonde lounge singer named Tina Carlyle (Cameron Diaz, in her first film role), isn’t all she seems to be; she flirts openly with Stanley, but only so she can record secret video of the bank vault for her mobster boyfriend Dorian (Peter Greene), who’s planning to rob the place in the next few days. One night, after he’s ditched at a club by his friend / co-worker Charlie (Richard Jeni), a dejected Stanley heads for home. But when his clunker of a loaner car breaks down on a bridge, it leads Stanley to a discovery that is destined to change his life: a jade-colored mask. When he puts the mask on, Stanley magically transforms into a completely different person, with a green face, super-human abilities, and a confidence level that the real Stanley could only dream of. Over the course of several days, Stanley (while wearing the mask) will steal money from his bank (before Dorian’s gang gets a chance to) as well as the heart of Tina Carlyle. Naturally, neither of these sits well with Dorian, who dedicates all of his resources to tracking down the green-faced lunatic that’s ruining his life. Throw in a bad-tempered police detective (Peter Riegert) who has to clean up the mess Stanley’s Mask leaves behind, and you have a double dose of bad news that could spell the end for our hero. Based on her performance in this film, you’d never believe that The Mask was Cameron Diaz’s big-screen debut; a natural beauty, she also exudes the charisma of a star even at this early stage of her career (and as introductions go, her first scene in The Mask can’t be beat!). But, as expected, the real show-stopper is Jim Carrey, who wins us over with his hapless, nerdy portrayal of Stanley Ipkiss while also wowing us with his antics as Stanley’s God-like alter-ego. Of course, most of what happens when he’s wearing the mask is CGI-enhanced, and his gestures and ticks owe quite a bit to classic cartoons (at one point, he creates a whirlwind much like the Looney Tunes’ Tasmanian Devil, and later on, while watching Tina sing on-stage, his heart beats out of his chest and his eyes pop out of his head). Still, there’s plenty of Jim Carrey in the character as well, from his exaggerated facial expressions to his over-the-top line delivery (after his initial transformation, he looks directly into the camera and says “Smokin!” in a way that only Jim Carrey can). To be fair, the CGI is phenomenal, and allows Stanley to perform some amazing feats (his and Tina’s dance routine is my favorite sequence in the entire film). What’s more, we get to see what happens when a few other characters try on the mask (not all of whom walk on two legs). This, combined with the chemistry between Diaz and Carrey, helped make The Mask a box-office hit (it grossed $119 million in the U.S. and about $350 million worldwide), and in so doing trumpeted the arrival of Jim Carrey as Hollywood’s newest superstar.